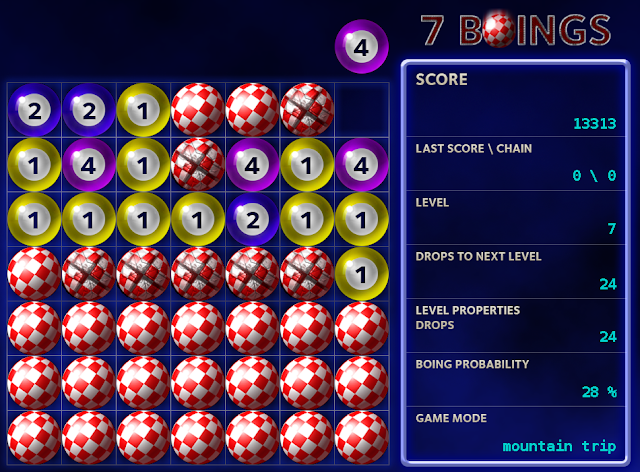 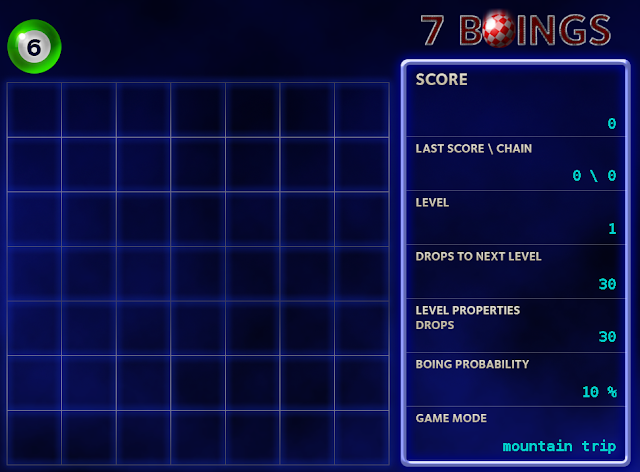 7 Boings is a sort of Tetris style puzzle game with a different spin on the usual gameplay on how balls are placed in columns, and how the rules determine which balls are removed from the game when matches are made. 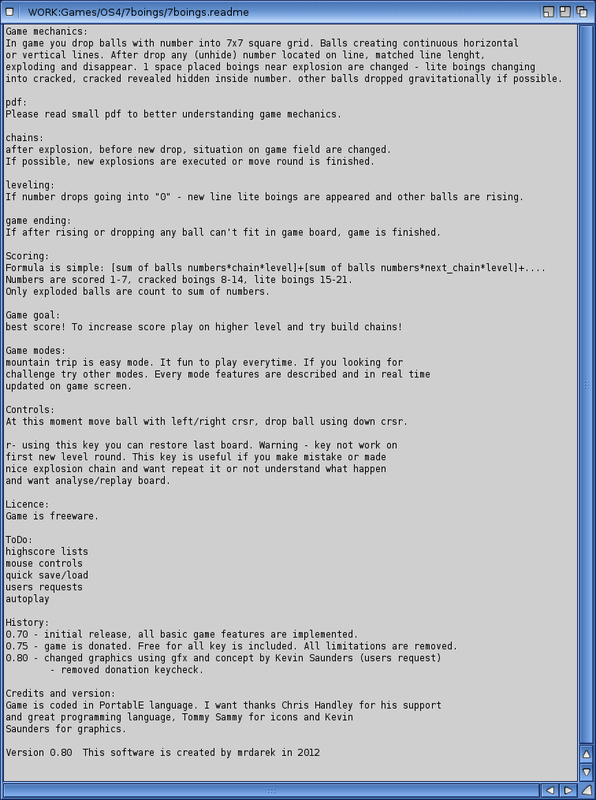 The rules are a bit involved and confusing at first, especially regarding when balls are exploded and removed (well for me it was confusing anyway!). It is certainly different! Basically, you move the ball you are given into position using the left and right cursor keys and down arrow to drop into position. 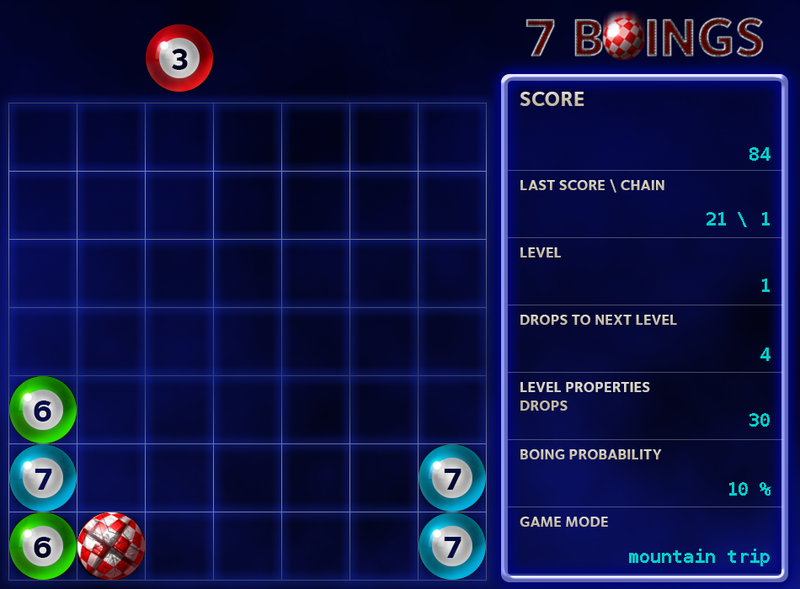 Then the next ball appears. 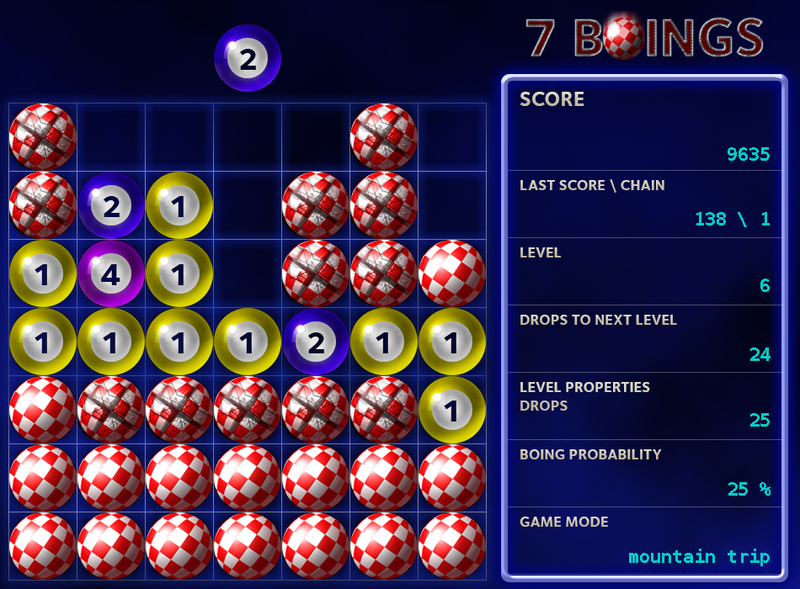 The game continues until the game field is full of balls and no further moves can be made. The game runs on the workbench screen - there is no option to run full screen. 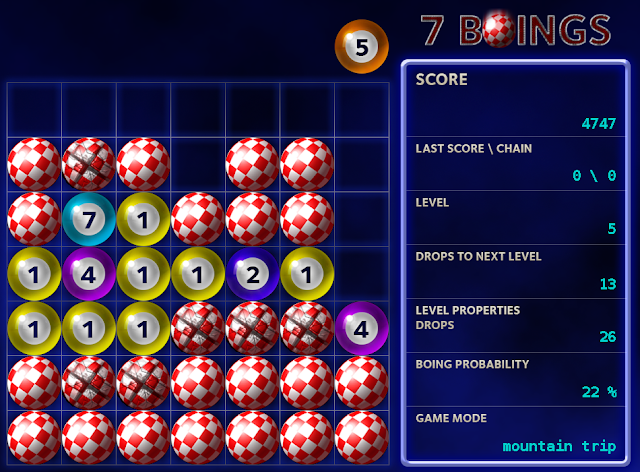 At first I was confused by the colours and numbering in the game, as it made it appear that placing the same numbers and colours together it the goal, when it is not. The number on the ball dictates a match when the number of balls in a line (vertical or horizontal) will match the number on the ball being dropped. When a match is made the ball explodes, only with other similar numbered balls in the same line. In addition to this, as the game progresses, Amiga Boing Balls appear which take 3 explosions to get rid of. 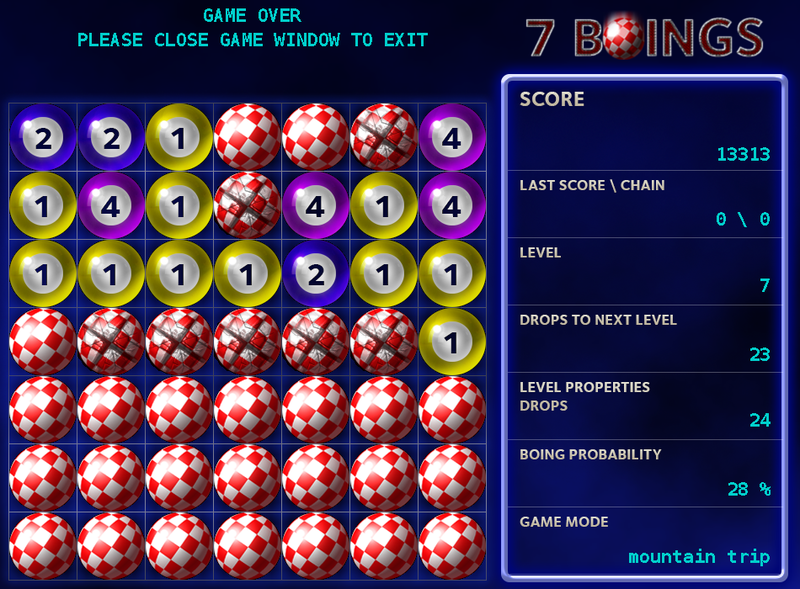 The first fractures the ball, the second changes the boing ball to reveal a normal number ball, and then third gets rid of it altogether. But I kept trying and eventually got the hang of it. 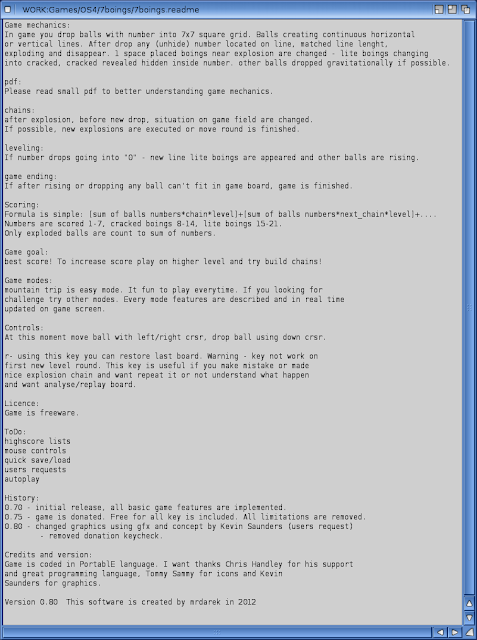 Reading the readme helps but playing it makes it easier to follow what the readme rules explain. There are 7 columns and 7 rows in the main game, along with the Amiga Boing Balls, which makes sense why the game is called 7 Boings! 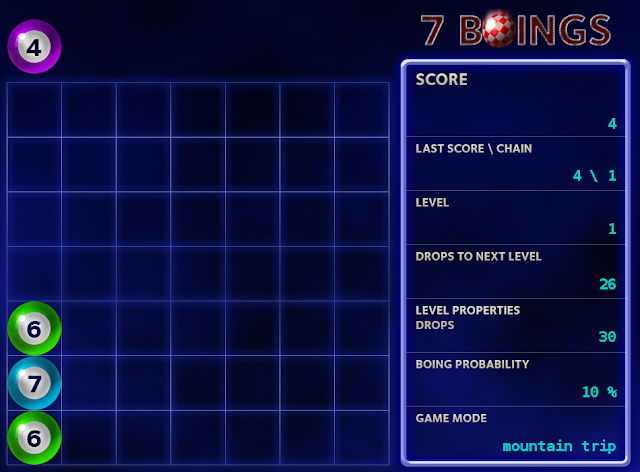 7 Boing is now free, and it is an interesting game. 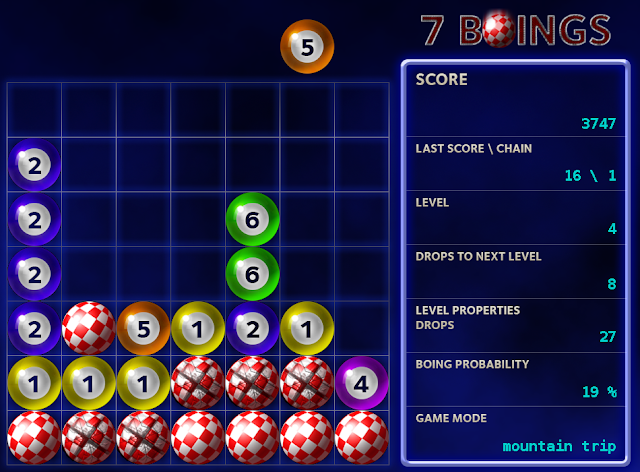 Although there is no music and just spot sound effects, the game is fun to play, although difficult to work out at first. It is great to see yet more original games for AmigaOS4 in 2012! 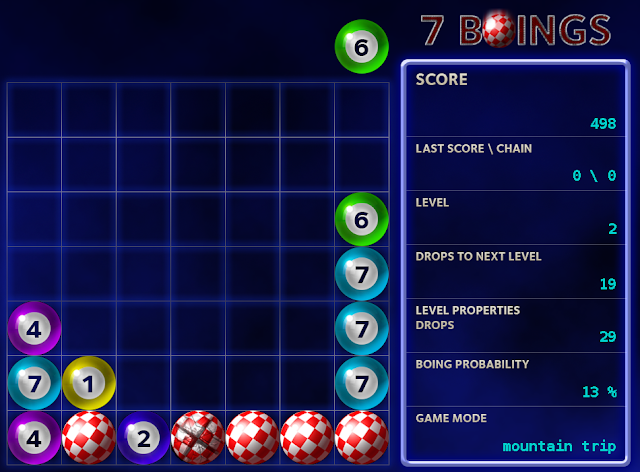 It takes some time to understand the game mechanics in 7 Boings, but it is worth it, because behind the slightly confusing rules is a good game!